In this interview, Philippe de Lespinay charts the history of slot cars, from the prototypes that ran on model train tracks up to the slot car crash of 1968. Along the way, he discusses such models as the Cox Chaparral 2E and the Tamiya Dodge Charger, as well as “thingies.” De Lespinay is the curator of the Los Angeles Slot Car Museum and wrote the widely read “Vintage Slot Cars”. Growing up in postwar Europe, there wasn’t much money around, so you had to make your own amusements. I’d look at the toys in a toy store, go home and draw, and then build what I had seen out of cardboard and construction paper. Then, in 1957, I saw a new Scalextric slot car racing set. It came out in late summer and was in French department stores by Christmas. The track was a figure eight and it came with little push-button controllers for the cars. Suddenly you could actually race somebody on your own track. It was a whole new dimension in play. According to our information at the Los Angeles Slot Car Museum, where I’m curator, the first model racing cars date to 1899—that’s the date of the first American patent. We also found a picture from 1904 of a racing layout for model cars in a French spa near Paris. By 1906, the American model train company Ives made a prototype of a model car that ran on a model train track. It was shown at a trade show but was never commercialized. In 1908, the German firm Märklin issued a single car to run on a train layout, and then in 1911, the American company Lionel produced the first true racing set for cars. They had two very heavy tinplate racing cars with little drivers in them crouching forward. These two cars raced on a modified model train track and were run by AC electric motors. There was a transformer, and you could control the speed of each car. We have one of these sets at the museum, which is owned by my friend Scott Bader. In the 1980s, Lionel reissued reproductions of the cars, which are also now highly collectible. By 1912, slot cars were on the market and very popular, but after World War I, Lionel stopped making the sets. Nothing really notable happened in the field until about 1936, when Märklin issued a racing set with two fairly heavy tinplate cars, again using AC electric motors. These new cars were no longer designed for model train tracks. The Lionel cars and Märklin cars had run on a raised rail, not a slot. There were pickets set around the track that kept the cars from going off the edge. When the car would slide, the inner wheel would hit the rail and stop any further sliding. Collectors Weekly: What’s the genesis of the first modern slot car? De Lespinay: The first true slot car system was patented in the 1930s in the United States, but nobody knows whether any vehicles were actually produced. Apparently the set was patented and then offered to several toy companies, but the inventor decided not to pursue it. In 1949, a British fellow named Woodland designed and built a beautiful little Maserati slot car. The car appeared in a 1949 issue of “Model Maker,” a magazine out of England, but slot cars didn’t gain acceptance until 1957. 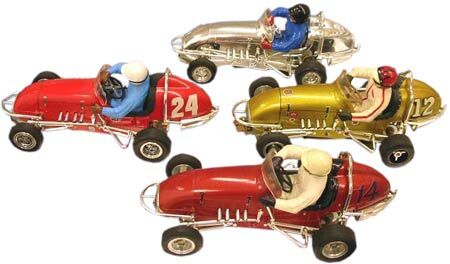 Monogram's Midget Racers were made in the same 1/24th scale as many other slot cars. In 1957, Scalextric made tinplate cars with a spring motor. Fred Francis designed a modified tinplate car using a rotary guide on the front. It ran into a slot track made of molded rubber. It was very much like a modern track. Victory Industry Products, VIP, put out an almost identical product at the same time and the Model Road Racing Company, or MRRC, eventually made a complete set. Those were all British companies. In an issue of “Sports Cars Illustrated” from that year, Bob Coogan, the brother of the actor Jackie Coogan, wrote a four-page article about a fantastic new game he called tabletop grand prix. It featured a new Scalextric set imported by Polk’s Hobby in New York. That absolutely launched the whole thing in the U.S. Suddenly there were slot cars everywhere. People started forming slot car clubs and building tracks. Bob Coogan opened the first commercial slot car raceway in about 1961. In the meantime, Strombecker in Chicago began making a copy of the British Scalextric with a different approach to the chassis and the body [see its Ferrari Testa Rossa at top]. The Strombecker became the most widely marketed set in the U.S. because it was a lot less expensive than the English Scalextric sets, and just as good. Collectors Weekly: Who were some of the other early slot-car companies? De Lespinay: There were many companies making parts by 1961 and complete cars by ’64. Toward the end of ’63, the big toy companies in the U.S., including the model kit companies like Revell, AMT, and Monogram, were investing massive amounts of money to produce brand new mini-car kits in both 1/24th and 1/32nd scale. It’s no longer very well known that in the 1960s, sales of slot cars, 1/24th scale especially, were a $350 million industry. Classic Industries sold more than a million Manta Rays in the 1960s. In the meantime, an English company called Highway Pioneers made various scale kits, including tiny 1/86th-scale kits. Then Aurora bought the company and began marketing its new HO-scale Thunderjets. They eventually became the biggest sellers. Department stores and hobby shops sold millions of those little cars packed in racing sets, but Thunderjets could never be mixed or matched with cars and tracks in other sizes. In fact, to this day, people who collect HO cars don’t collect 1/32nd-scale cars or 1/24th-scale cars, and vice-versa. They live in different universes. For many years, collecting magazines have only covered HO when it comes to slot cars. There’s nothing wrong with HO, but it’s time for the hobby media to realize there’s a lot more out there. The vintage 1/24th scale and vintage 1/32nd scale are huge. They need to wake up to that fact. After Bob Coogan made his commercial raceway, other companies started building eight-lane tracks for 1/24th scale in masonite and wood and selling them all over the country. When the American Model Racing Congress was formed in Beverly Hills, they decided to take over the manufacturing of all tracks and organized races sponsored by Ford Motor Company and Dodge. They had various league races and a big final once a year. Aurora organized similar events, but in HO scale. Then, in 1966, AMF, which had all the bowling alleys and that sort of equipment, purchased the American Model Racing Congress and added slot car tracks to its line. AMF franchised all the stores. They basically gave their franchisees complete stores with inventory and everything, but the people who ran the stores generally knew nothing about the product or the hobby. Most of them failed commercially because they were not business people. They were generally retirees who invested in it because it sounded like a gold mine, which was how it had been presented to them. To properly run a commercial raceway, you needed to have another business on the side. It could be a restaurant or even a hobby shop. By 1968 the whole thing was beginning to crumble. Then came the 1968 Chicago blizzard, which happens the same week as the annual industry trade show. Nobody came, and that absolutely killed the hobby. A lot of the companies just quit after that show. Literally hundreds of manufacturers that had been involved in the craze were impacted to some degree. At one point there were millions of American kids playing with slot cars. Nobody knows exactly how many commercial raceways there were in the U.S., but it’s estimated to be between 3,000 and 5,000. In comparison, there were only 2,800 bowling alleys. In the Los Angeles area, there were 50 raceways. Now there’s one, in Buena Park. There are now between 150 and 200 raceways in operation in the U.S. We have a listing on our Slot Blog forum at www.slotblog.net. We keep it as current as possible. New Jersey seems to have the most raceways. Collectors Weekly: Did the collapse of the pastime change the collectability of the cars? De Lespinay: Yes. Revell probably wrote off and threw away millions of dollars worth of merchandise. Cox did the same and nearly went bankrupt. Leroy Cox was forced to sell his company in 1969 to a holding company called Leisure Dynamics. The first thing Leisure Dynamics did was toss out $5 million in inventory. You now have condominiums in Irvine built over old Cox kits. 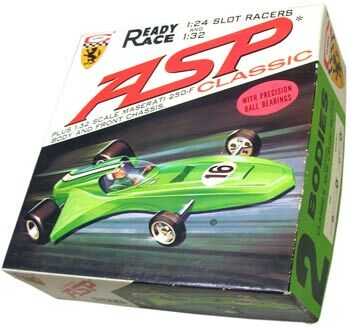 Classic's ready-to-race Asp was a 1/24 scale car, but it was sold with chassis parts and a body to build a 1/32 scale Maserati 250F. Naturally those have become very difficult to find. The ones that were sold are now used, but collectors want unused collectibles. So the brand-new unused kits have become very desirable. By the end of the 1990s, before buying and selling on eBay became commonplace, some of these kits were going for as much as $10,000. Prices are down now because of eBay. Basically, eBay brought everything that was buried to the surface. Some of these kits that were very rare aren’t quite as hard to find anymore. People who invested very heavily in the ’90s are now showing a big loss. The collectors are still here, though. Collecting is still going very strong, but there’s not much left to find because so much is already in collections. There were a lot of big finds between 1980 and 1995—old toy stores that had been packed up in the 1960s. So that stuff became very valuable. But there are no more secret warehouses today. Almost all of the ’60s stuff is highly collectible, with the exception of a few very mediocre things. There was a company in California called Eldon that made very crude 1/32nd-scale cars. They have a few interesting models, but they’ll never be worth much. Most of the kits made by top-level companies like Revell, Monogram, and Cox—as long as they’re mint, in-box, untouched—are still very valuable. The aesthetics of the vehicles are fantastic, and the packaging can be superb. You want to display the item new in its original packaging because that’s part of the deal. If you look at some old collectibles from the 1950s, like model airplanes by Cox, the box is sometimes much nicer than what was inside. Collectors Weekly: Do collectors only look for complete kits? De Lespinay: In 1964, Classic, an important company from California, came on the scene. It was one of the first companies to have a fully assembled ready-to-race 1/24th-scale model. It sold more than a million units from early 1965 to 1967. In ’65, most companies issued kits, with only a few issuing ready-to-race models in 1/32nd-scale for home raceways. When you bought a Scalextric set, you could also buy Monogram or Revell assembled cars. It wasn’t until 1965 that you could get ready-to-run cars in 1/24th scale. That’s what the customers wanted so the market changed, and big companies like Monogram, Cox, and AMT simply offered assembled models instead of more new kits. That’s also when production shifted from the U.S. to Hong Kong and Japan. For example, Cox had a deal with Mr. Wai Shing Ting in Hong Kong. Mr. Ting worked for all kinds of companies in the U.S., making model trains and toy cars. The company became Cox International, but it was really Ting’s outfit. He was producing the ready-to-race models for Cox, and then shipping them to Santa Ana where they were verified, tested, and put inside smaller boxes as ready-to-race models. Cox sold hundreds of thousands of each model until the pipeline was full by the end of ’67, and then everything collapsed. 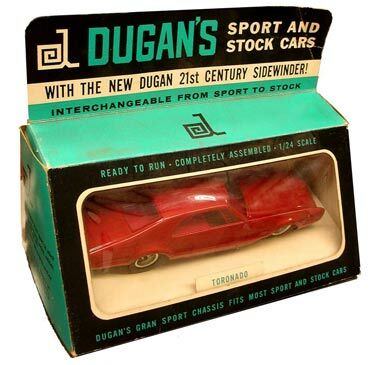 The Dugan Oldsmobile Toronado from 1967 is quite scarce, especially inside its original box. These models are now highly sought after. Most of them were played with, demolished, and thrown away. The Vietnam War was actually a big factor because many of the young men who were playing with these cars were drafted. Their moms or dads threw their slot car collections in the garbage. We have a lot of these stories from people about how their stuff was thrown out. There’s still a lot of stuff out there, but it’s mostly parts. The cars and brand new kits in the box are much harder to find. Ebay is the place to find the more common ones. Auction houses rarely sell slot cars. They’ll sell tinplate toys, toy soldiers, even old Tootsietoys, but they’ve never really touched the slot car market, which is strange because it’s very big. I wrote a book for Motorbooks International in 1997 called “Vintage Slot Cars.” It was supposed to be about 380 pages with all kinds of great stories and pictures. But the publisher was afraid they wouldn’t sell and demanded that I reduce the book to 96 pages. They expected the book to sell 3,000 copies over three or four years. They’ve sold 26,000, and it’s been reprinted four times. That’s a big number for a hobby book. It’s out of print now. So that $15 book might now sell for $150, if you can find it. That means the interest is still there. I’m writing a new book that will include the first complete listing of every slot car that was ever made. It will have a description of the car, the type of motor, and other things. There will also be all kinds of side stories in there, too. For instance, in the new book I talk about the Mabuchi Motor Corporation, which is now the largest electric motor company in the world. It has 10 factories, making eight million electric motors a day. Toyota, for instance, will put 15 or 20 Mabuchi motors in each one of its cars—for electric windows, mirrors, seats, and fans of all kinds. All of those motors are made by Mabuchi, now mostly in China. Mabuchi was a company of about 10 people when they started making slot car motors. In two years they had something like 500 employees. Another year later they had a thousand employees. From 1964 on they made just about all the motors for every slot car that was produced. There were millions of motors, so this is a very important side story. After the slot-car crash, competitors absorbed companies like AMT, which was basically bankrupt by then. Cox was nearly bankrupt when it was approached by a holding company. So they made a huge amount of money in the beginning and then lost a lot at the end. The only one that survived was British Scalextric, which had only briefly gotten involved in the 1/24th-scale market. Their late-entry came in 1967, when they issued four models and a racing track with three lanes. It arrived in a market that just didn’t want slot cars anymore. Russkit also went under. Jim Russell, who was one of the pioneers in the hobby industry, founded the company. By 1968 he was being hounded by creditors. He lost everything but ended up as an engineer making $60,000 a year, which was pretty good for the day. People also began to realize that a lot of the manufactured slot cars were not very good. They looked nice, but didn’t run very well. So many people started making their own cars using steel wire, brass, brass plate, brass wire, and components they would buy at the raceways—wheels, tires, gears, motors, bodies. By 1966, those hobbyists represented about 80 percent of the market. People were still buying the new kits and ready-to-race cars, but not nearly as much. 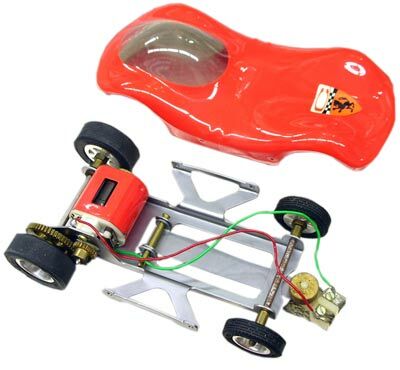 You’d go to a raceway with your brand new Cox car assembled in Hong Kong, put it on the track, plug in your controller, and get blasted off the track by homemade cars of brass and steel wire with vacuum-form lightweight bodies. That inspired a lot of people to make their own cars. When you find an old slot car box, 90 percent of the time it will have homemade, hand-soldered cars with vacuum-form or hard plastic bodies. These typically aren’t very valuable because the kids making them were not the greatest craftsmen, but a small number of very talented people started making really good cars by hand, and with very intelligently designed frames and motors that were completely taken apart and blueprinted. Those cars were very efficient. 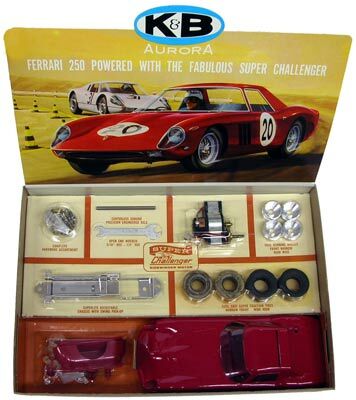 K&B's Ferrari 250 kit came with the company's powerful Super Challenger sidewinder motor. In 1966 an American magazine organized the first pro racing series in the U.S. The participants showed up with gorgeous cars, and the racing was very competitive. Cars had to be built to certain specifications. Pro racing is still alive today. It has evolved to the fantastic speeds of today’s pure racing machines. They use the most advanced electric motor technology and go at incredible speeds. It’s become quite an expensive hobby, though. In the meantime, the late 1960s and early 1970s pro racing cars have become highly collectible. There was almost no demand for them in, say, 1995, but they sell today for $1,000 for a good car with a history. When I started collecting slot cars, few people really wanted these types of cars, but they’re absolutely beautiful. The craftsmanship is unbelievable and the paint jobs are pure art in many cases. In fact, there were some very famous slot car body painters back in the day. In the last 15 years, it has become a new form of collecting. In recent years people have collected things like the 1/32nd-scale model cars made in China for European companies like Scalextric, Fly, and Ninco. People have paid a lot of money for special versions that were supposedly rare because they only made 2,000 of them, but all 2,000 were bought as collectibles, so they’re not rare now, and will never be. They’ll never be worth much more than what they cost new—$30, $40, and that’s it. A lot of people made the mistake of collecting as an investment instead of for the fun of it. Right now the market is pretty stable. The vintage market is solid. A good item sells for a lot of money, and the competition for it is fierce. Common items are fairly cheap, as they should be. Collectors Weekly: Who were some of the primo painters? De Lespinay: The best painter of them all was Dave Bloom. His style was wonderful. He was the first to deviate from normal paint jobs to psychedelic designs or the name of the racer on the car in big letters. Bob Kovacs in California is still a very famous painter. He paints motorcycles and cars now. Those are the two biggest names. There were others, but these two guys dominated. Bob Kovacs painted virtually all the bodies on the pro racing cars on the West Coast. On the East Coast, it was all Dave Bloom. The problem is, it’s dangerous to be around paint fumes, thinners, and acetone all day long. Dave Bloom died of cancer in about 1995. Bob Kovacs is still okay, but it’s a dangerous business. In the museum’s collection, we have quite a few of the Kovacs bodies mounted on cars, and quite a few of the Blooms. We also have replicas made by very talented new painters. Collectors Weekly: Were the kits modeled after actual cars? De Lespinay: Yes, most of them. Classic was one of the few companies that made dream cars or freaky cars. Classic’s first car was the Manta Ray. It was very loosely modeled after a real custom job made by Dean Jeffries in Los Angeles. John Power designed the Manta Ray. It was a bubble top. After that, all of Classic’s really successful cars were dream cars. When John Power quit the company after a dispute with the owner, he went to work for BZ, Beck and Zimmerman. Power designed a dream car for them called the Banshee that was going to kill the Manta Ray on the market. But the Manta Ray was so successful that nothing could stop it. The Banshee sold very well, but never in numbers like the Manta Ray. The BZ Banshee was an original design by John Power, the man behind the styling of Classic's Manta Ray. After John Power left, Classic hired Bob Cadaret, a General Motors designer. He had designed the’55, ’56, and ’57 Chevys for Bill Mitchell at General Motors. Those cars were very successful and are icons today. Bob worked at Classic for two years until it literally collapsed after the crash in ’68. Then he went back to General Motors and concentrated on designing car interiors. Cadaret designed some fantastic machines for Classic, like the Stinger, which had a working wing. When you flapped the wing the car slowed down because the motor would hold it slightly at an angle. He designed the Gamma Ray, which was an extraordinary looking car in shades of purple and yellow. He also did the Asp, which was lime green. Kids bought them by the hundreds of thousands. Larry Shinoda, a Japanese-American, was the number-one designer at General Motors in the 1960s. He worked under Bill Mitchell, who was basically the vice president of styling. Shinoda designed the Corvette Stingray and the famous Mako Shark, plus a bunch of other cars like the Pontiac GTO. Larry was a fan of slot cars. For about two years running he’d go to a raceway in Detroit called the Groove. He’d be there every day. He started making bodies of his own design on the vacuum-forming machine at the General Motors Research and Development Center. He made bodies there called “thingies” that were eventually produced commercially in small numbers. Very serious people raced those cars at the Groove. They were the fastest things in America at the time because they were designed for functionality. All the other companies were making realistic cars. Cox was making Lotuses, Chaparrals, Ford GTs, and Ferraris. Monogram was also doing extremely realistic models of Ferraris and Lotuses, but a few companies were making thingies, which were very successful. It’s a whole other dimension. Today, Larry Shinoda’s clear plastic bodies—crudely formed onto very crude patterns—sell on eBay for $300 or $400. Of course, those bodies will never be assembled. They’ll never be completed as a car. About six years ago, Edo Bertoglio, a very good freelance photographer who worked for “Vanity Fair” in New York in ’69 or so, found an Internet site featuring models of thingies. He fell in love with them. He had a very successful gallery exhibition of thingies in Milano last year. He’s doing another one in Lugano, Switzerland, this year. He photographed scantily clad young ladies with the cars. They wore lipstick that matched the color of the car, and things like that. They were beautiful, very artistic photographs. Slowly but surely, slot cars are becoming recognized as a form of toy art, like tinplate toys or diecast models from before and after World War II. That was before the heated-plastic era in the 1960s, which virtually killed the tinplate industry and the good toys. The toys made today can’t compare with the old ones. It’s very much like automobiles. Would you collect a new Volkswagen Beetle? Would you collect a new Camaro? Those cars will be rusting in junkyards in a few years because they don’t really represent anything but false nostalgia. The real nostalgia is for the Camaros of the ’60s. They represent a completely different era when things were still made by hand and you could sense the personalities of the people behind the object. The same goes for the Japanese tin toys of the 1950s. The Marusan tinplate Cadillac is an absolute piece of art. It’s just fantastic the way it’s done. Marusan toys were built by hand by craftsmen and assembled in very substandard facilities, but those toys sold very successfully, especially in the U.S. There are plenty of them around today, but there also always plenty of bidders for them, too, because they’re so beautiful. Collectors Weekly: What are some of the most sought-after kits? De Lespinay: The most collectible kit ever is the Cox Chaparral 2E. Less than 25 still intact are known to exist today, although they made thousands of them. Many of them were destroyed when Leisure Dynamics dumped its leftover inventory. Jim Hall started the Chaparral Company. He worked in collaboration with General Motors out of Midland, Texas. He signed a contract with Cox in Santa Ana to produce exclusive approved-by-Jim Hall Chaparral models. Cox sponsored Jim Hall’s racing to the tune of about $10,000 in 1965. 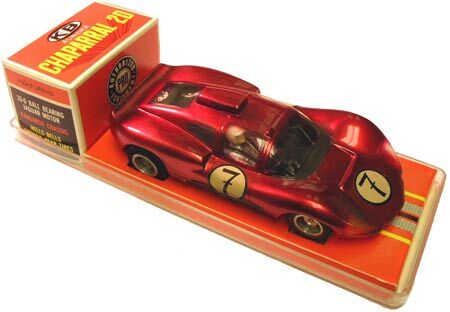 This K&B Chaparral 2D slot car was powered by a Mabuchi FT26 motor and featured metallic-red paint. They made that particular kit in three different versions, but the most valuable is the “Mag Frame.” At least two of them are known to have sold at auction for $12,600 a piece. The values have gone down, but one would still sell at auction for at least $4,000. That’s quite a jump for a plastic kit that originally cost $9.95. If the item is perfect, it still sells for big money, but anything less than mint loses 50 percent of its potential value instantly. Kits that someone has already assembled go for maybe $1,000 for a very nice one. It’s a little harder to say what the most collectible car is among the factory-assembled ones. I’d still say it’s the Cox Chaparral 2E, the ready-to-race version. It’s made of a much softer plastic than the kit. It uses different wheels and tires and has a less-realistic but great-looking chassis. And the box is beautiful. These are generally worth $1,500 for a mint boxed item. They’re not rare, just very desirable. They made a lot of them. Tamiya and other Japanese companies got into the hobby market in 1965 and were very inspired by what the Americans had done. Tamiya made a Dodge Charger stockcar kit that would easily go for $5,000 today. Very few were made, and they were sold mostly in Europe. That’s probably the most desirable foreign kit. Collectors Weekly: What’s the racing scene like today? De Lespinay: The most successful form of commercial racing in the U.S. right now is retro racing. It’s a return to the late 1960s and early ’70s technology, but using modern motors made in China. In comparison, there’s virtually no racing in the 1/32nd-scale market with brand new cars in the U.S. People have their own home layouts but they don’t race. In Europe there’s racing, especially in Spain and Italy. In Germany they’ve gone to hyper-realistic 1/24th-scale model racing cars using new German and Japanese chassis made out of bolted parts, steel, and brass. The bodies are made of cast resin and decorated with incredible details, to the point that they’re basically perfect racing models. Collectors Weekly: What are some of your favorite models in the museum? De Lespinay: My favorites are the models handmade by Gene Wallingford in the 1950s and ’60s. Gene is now in his 80s and lives in Indiana. He made some gorgeous 1/32nd-scale hand-built cars. He made everything but the motors, wheels, and stuff like that. We were able to purchase almost his entire collection of models from the ’50s and ’60s. Miyazawa slot cars from Japan, such as this Lotus, were made out of aluminum. I love my own pro racing cars that I restored for the museum. I made them between 1971 and 1973. At the time I had no green card in the U.S., so I actually made a good living by racing slot cars, making them by hand, and selling them to people. I was a pioneer in design at the time as far as technology and body design. I’m also a fan of some of the Cox cars. They made a thingie called La Cucaracha, which is, of course, “the cockroach” in Spanish. It was a little orange beast that sold very well. There are variations of them. We must have 20 or 30 at the museum in different versions. That’s a great car. Cox pretty much comes out on top. MPC, the Model Product Company, from Mount Clemens in Michigan had some gorgeous models, too. I think the biggest mistake toymakers make today is that they try to create exact models of cars, planes, or boats. There’s no poetry to that. When you take an actual object and exaggerate its features to make it a little more child-friendly so that it becomes a toy, then you have something great. That’s what the Japanese did. Collectors Weekly: Just to clarify, were vintage slot cars in the 1960s made out of plastic or metal? De Lespinay: All the kits had plastic bodies. There were two distinct types of plastic: injection-molded and vacuum-formed. The former is a hard plastic with color molded into the plastic. Cox, Monogram, Revell, and other companies made those. The latter is a clear plastic formed by heat over a mold and then hand-trimmed and hand-painted. The paint is done from the inside of the plastic. It’s very shiny and glossy because the plastic looks like it has glass over it. Cox's La Cucaracha GT was marketed as the Super "Cuc." Its blue polypropylene body had front fins and a slot in the engine compartment to receive the tab holding the roof. The vacuum-formed kits have a charm all their own because they were hand-painted. Each one is slightly different from the next because they weren’t made in big injection-molding machines. They were trimmed and assembled by hand. Some of the color schemes on these particular cars were especially beautiful. You couldn’t reproduce these colors again today because there was lead in the paint. Lead brings the color to a level that’s absolutely impossible to duplicate today. The tinplate toys, diecast toys, or slot cars made in the era have that special lead glow. The chassis were always at least 99 percent metal. Types of metal ranged from diecast magnesium, which corroded very easily, to brass, which stained. The environment in which the cars are stored is very important. You can have a sealed mint kit, and its brass pieces could be completely corroded if they’ve been in a humid environment. Some chassis were made of steel and others were made of aluminum. Today they’re all plastic. One thing people forget are the tires, which were very important in slot cars because they helped determine how the car would handle on the track. There were all kinds of variations of rubber—natural rubber, neoprene rubber, foam rubber. In fact, we’ve found several hundred companies that made wheels and tires. That’s a lot of companies devoted to one small aspect of a toy. Great interview Philippe! Thanks for everything you are doing to research and document the history of this great hobby! Now, decades after the slot car craze hit the United States, many enthusiasts still consider it as their hobby of choice, a link back to a gentler age and many a gray beard can still be seen holding a controller, remnants of when slot cars were king. Thanks for a great interview on a hobby many of us still love and nobody knows that better than Philippe! I never knew just why the hobby died like it did until your great article. We met briefly at one of the Chicago slot car shows before Ebay changed everything. I have sold many custom and restored vintage slot cars all over the world. If I can be of any service to you in the hobby, please do not hesitate to contact me. I cherish the signed copy of your first book and look forward to your next one. Thanks for your devotion to the hobby that brings back our childhood. I have a few corrections for your slot car history along with a very short overview of that time.Bob C. was the younger actor brother of actor Jackie C.; Bob was also a member on our sponsored slot car racing team from 1958 – 1963. Bob had the requirement for a new business location in the middle of 1958. He selected the location for track placement, product distribution and walk in traffic. He was the MRRC distributor for the west coast, but shipped all over the US and Canada. I helped build and landscape his racing circuit during late 1958 to middle 1959. It was approximately 180′ in length with 4 lanes for operations. A lot of hobby shop and private club owners visited this new track and immediately wanted to build their own circuit. The hobby exploded from that point. The hobby was initially created for teens and adults over 15 years of age. Let me know if you want to explore any information. That’s a great article Maribeth; thanks for drawing it to my attention. It’s fascinating to find out more about the pioneers of our great hobby. The aim of my site is to encourage the racing of vintage slot cars. This brought back so many memories, good ones of course. I was one of those Detroit boys (from age 11-15 yrs old in the late 60’s) that hung around ‘the Groove’. After trying to strip down & soup up my Jim Hall Cox Chaparral 2D to keep up with all the ‘thingies’. I went thru the ‘stinger’ stage (back end vitually went up/down depending on your speed. I eventually gave up & had a guy build a ‘thingie’ for me.By the way, the chassies were usually made of brass & soldered piano wire, spungy silicon covered tires (the newest thng at the time and of course a ‘dyno puple rewind engine was the most popular and competative at the time. Just got back into slot cars; pretty much collecting vintage on Ebay and racing some newer stuff with my 11 yr old son.Great time of bonding. Wish my dad would have done that with me, he was too busy delivering milk. Yes, I am the son of the milkman. And of course, ad me to your list. My mom threw my slot car stuff away while I was in Viewt Nam. Keep it up Philippe, please let me know when you finish the book. Question, where is the museum you speak about. I recently found my 1957 scaletrix race set. I had 5 cars and the figure 8 track. All of the original parts are still there including the cardboard guardrails and the cardboard brige that crossed over the track. How can I find the value and someone who might want to purchase it. I am now 65 and am into big boy cars now. Gentlemen, thanks for your comments. GMA is correct about the date of Bob Coogan’s first raceway, it was in 1958. It did not come out correctly on the story, but is correct in our new upcoming book. David Kays will be pleased to see many of the actual Larry Shinoda designed, Dyna-Rewind powered “Thingies” that ran at the Groove in the book and soon on the LASCM.com website. To Paul Ober, I am sorry to be the bearer of bad news: unless your set is in pristine condition with virtually no visible use and a perfect outer box, it is only worth the value of the cars in it, and unless the cars are in pristine or near pristine condition, they will be worth little. Pictures can be sent to Electric Dreams at shop@electricdreams.com for free and more accurate appraisal. Please note that these pictures were taken in early 2008 and lots of progress in the construction and display have been made since. The museum is still in a temporary location inside the building. I believe that these are repackaging of OK Kader products manufactured in Hong Kong if in the 1/32 scale, or Japanese Hasegawa if in the 1/24 scale. Actually, Carrera issued their 1/24 scale slot cars in 1967, and added models as the years went by. The original models were of a Lotus 40, a Ferrari Dino and a McLaren MK6, all with vacuum formed bodies. By 1970, others were added such as a McLaren MK2, Cobra Daytona coupe, a Cobra roadster, a Ferrari 512, Porsche 917 etc. Carrera also issued a Porsche 906 with an injected body. Because the track is still produced today, the vintage 1970 track has no more value than the newer stuff so you should not worry about that. As far as the cars are concerned, if they are in excellent to near mint condition, depending on their chassis type, they can be worth anything from $25.00 to $125.00, but hardly anymore. The older chassis with the Mabuchi motors are worth more. As far as finding the missing car, first you have to find which one is missing, but I could not find a period catalog handy, so you will need to do a bit of search. I enjoied the article. I hope to get a copy of the new book. I do happen to be one of the few that collects all scales, but I will admit that I was raised on h.o.’s . It has been a fun hobby, that I have enjoyed most of my life. I love the story and some history involved. I have been collecting H.O. slot cars since 1970 and have a fleet of 4000 cars of many types,17 trophies and a booming business with great clients. In 2004 I took in a 1/32 Carrera Mille Miglia set from a client who owed me for some heavy work I did for him.I got hooked and impressed with 1/32 scale and now I have about 30 cars.Carrera is by far the best track and I put this track to a series of brutal tests and it always came out on top. I also have Eldons which I love very much and they run great on the Carrera track. I was able to restore some of them as well. I am always on the look out for Eldon cars parts,motors,etc. A NOTE; I am in serious need of Aurora plastic. I am looking for any kind of bodies with any damages like cut wheel wells,breaks, painted over bodies etc. Anything is acceptable. As in all collectibles, it all depends on condition of both the box (if surviving) and the contents. If could be anything from $35.00 all the way to $200.00 or more depending also on the version. Please check this website page to decide what exactly you have, and then ask me again? Copy and paste this link in a new browser. This is a fantastic article by someone who obviously loves the hobby. I think what’s so great is that you can buy a brand-new track and race cars from the 60’s! http://www.SlotWorkshop.com builds a fantastic track, and racing my older cars on it their tracks has been a joy :-) Thanks for a great article. You mentioned Robert (Bob) Coogan, Jackie Coogan’s brother, opened-up a commercial slot car racing store front in ’61. I remember that place well, and it was a favorite stop for me. I raced and purchased gear there. It was on Lankershim Blvd., in North Hollywood, California. Although this was many years ago, I believe it was abruptly closed under the suspicion of an illegal drug ring operating from there. Do you have any information on that? I remember being surprised at seeing something on the news one evening, and then the shop was closed after that. Ted, thanks for the information. Actually it was Lenny Bruce who was in trouble. It was in Bob Coogan’s slot racing shop that he was arrested and sent away on drug charges. Coogan closed the shop to open a distributorship on Sunset Blvd. in Los Angeles. Mr. De Lispany [sp], my name is John Hegedus. I was an amateur racer for Team Checkpoint from 1974-75. I won the amateur 1974 Western States Championship at Crash and Burn Raceway. Stork built the car and Bill Sr. gave me two Open 25’s to race. Imagine this, when I qualified I was turn marshaled by fellow Team Checkpoint members, Billy Steube, Bob Crane, Big Jim Greenmeyer, Gil Gundersen, Herb Wade, and Don Aspensen. When I raced these Team Checkpoint legends marshalled for me, with “Stork” and Billy Jr. pitting my cars. I didn’t even have to change stickers. I was the amateur USRA champion in 1975 at the age of 16. Bob Crane [a.k.a] “Stork” built my cars, and of course, Bill Sr. builit my motors. Billy Jr. drove me all over So. Cal. to the races. I have many good memories of my adolescence during this time. In 1976, just after Stork took Montes’s $1,001 bucks on the 4th of July, Bill Sr. asked me if I would be his “Group 20” racer. It was an offer of a lifetime, but I had to go on to college. The last time I saw Bill Sr. was at his shop in 1976 right before Stork went to Texas and won the Nationals. The last time I saw Billy Jr. was in 1980 at a race wherein he chastized me for “backing up” in the switchback. Recently, like last week, April 16, 2012, I talked with “Stork” for over two hours over the phone. It was at this time he informed of the loss of Bill Sr. and Bill Jr. and Aspensen and Big Jim. Incredible re-vist to great times in my life. This Satruday, April 28, 2012, I will be attending the “Retro Race” at Buena Park Race to meet with my good friend Bob Crane. I must of just missed you in my term with “Team Chcekpoint” in 1974-1976. I do have some questions for you. Hope to meet you soon. Join us for lots of fun, beats seating at home on the couch, eating potato chips and drinking beer, watching people pushing a ball from one side to the other. Nice article about slotcar racing. The book of Mr. Philippe de Lespinay, Vintage Slot Cars is one of the best books around, it gives a lot of information about collectable slotcars and a great insight of the history of mostly USA slotcar companies. It is definitely worth buying. I was not aware that there used to be such a huge industry behind it, especially during the heydays in the 1960’s. Ofcourse USA brands were difficult to find in those days in Europe, we had brands such as Scalextric, Carrera, Marklin Sprint, Fleischmann and later Ninco. 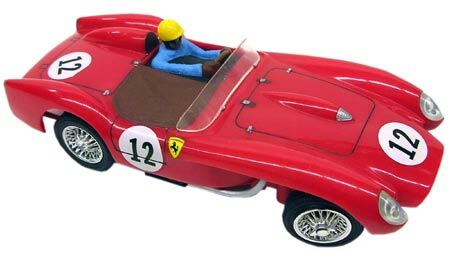 Nowadays a lot of other slotcar companies exist, SlotClassic from Spain, Ostorero from Italy and cottage industry from United Kingdom. Their products are often handmade and of very high quality. One thing I would like to mention is that when focussing to much on ‘the Holy Grail’ of certain slotcar brands, other companies are neglected and seem worthless, but when taking the time for a closer look, will have sometimes also rewarding technical novelties or design features. Looking forward to see the new book about slotcar racing of Mr. Philippe de Lespinay. Tom, I grew up on the south side of Chicago and never made it out to Hinsdale, but heard a lot about this raceway and it was mentioned a few times in the magazines, for the Arco and other big races. It must have been exciting growing up in a raceway! Were you an active racer? I remember well the slot car place in Hinsdale. I recall referring to it as “Jonesey’s place.” What fun it was. Going down the basement stairs was like the a trip to another world. You had a huge 8 lane 1/24 scale track, a smaller 1/32 scale track, and later, an 8 lane HO Scale track, too. I saw a track like your 1/24th scale for sale a few years ago on EBay, but I haven’t seen another an HO setup like you had. I remember being a corner Marshall at the hairpin turn just after the Monza during some of the races you held. The cars that raced were unbelievably fast and held on to the track like they were glued down! The cheap, out of the box, cars that I, as a 10-11 year old, could afford had crappy engines and tires and would constantly derail, but I loved going downstairs to hang out and watch. I remember that the store had an interesting and uniquely particular smell. I don’t know if it was from the compound that the racers would apply to the tires before a race or if it was just the ozone created by the electronics. What ever it was, it created a pleasant “air” about the place. I have been looking to buy an HO set like the one you had. Do you remember where you got it? I still have a couple of the scale cars, 1/24, 1/32, and HO, from that era. Your shop is a very fond memory of my youth. Thanks for reminding me of it. I stumbled over your web site while searching for something completely unrelated (no surprise) and thought I’d share my memories of one of Berkeley’s first slot car tracks. Built by Manny Luhn of Birdie’ Toys on Shattuck Avenue near University, it was a four-track complex set up in an old building normally vacant except for a Christmas-related store neat the holidays. Narrow but long, it had space for one eight-track steeply banked layout, one smaller banked layout, one flat track and a 1/24th scale two-lane quarter-mile dragstrip. The first and last were by far the most popular. We had a specialist contractor build the tracks; they and we were just learning, and the first attempt, using flattened braided cable sheathing glued into recesses beside the groove didn’t work. That all had to be ripped out and replaced by aluminum tape strip material. We ran at 18 volts, which made the normal 6-12 volt motors scream. Oddly, that didn’t seem to harm them. We opened in the Fall of 1964 and stocked what seemed at the time a large assortment of merchandise, ranging from Cox and Revell ready-to-run cars to parts and clear bodies for the builders. Manny was averse to calling it a slot track; we referred to it as Berkeley Model Car Speedway. It was so successful that he built a second, about twice as large, in an ex-Safeway grocery store in San Lorenzo, about 20 miles south. At one time or another I managed both as I worked my way through the University at Berkeley, right up to the time I went into the Army in mid-1966. By the time I returned in mid-1968, the Berkeley track was gone and San Lorenzo was fading. Great days! Manny’s gone, Birdies is gone, the tracks are gone, buy thanks for keeping the memories alive. Great article. The only question I had was the date on the Chicago blizzard, which you referenced as being in 1968. We had our worst blizzard in Chicago on Jan 26-27 of 1967 which I remember well and is well documented, but no blizzard in ’68 that I’m aware of or that I can find referenced in internet searches. So perhaps the early ’67 blizzard contributed to the lack of attendance of the trade show that year, which started the snowball effect of manufacturers moving away from slot cars. I was only 8 years old then and wasn’t involved in large scale slot cars at that time. Hi, to set the record straight, it was not Philippe de Lespinay or the LASCM, but another collector here in France, Philippe Point, who discovered the post card which seems to indicate a bunch of gentleman in top hats playing at “an electric tabletop racing game”, sometime in the early years of the 20th century. This has not been confirmed elsewhere, and we really don’t know much more about this, just that it’s a possibility there was some slot racing, or something similar going on before the Lionel set in 1912. Thank you very much for that amazing article!! history can be a beautiful thing and you painted a masterpiece! BLESS YOU!! What great memories! Strombecker and Atlas home track, a beloved K&B Ford GT, rewinding motors, frying a hand controller at the commercial track, making slot cars out of static models. Growing up in the 60’s was the absolute best! My slot racing days started in the late 50’s when I was about 12 years old. I slot cars was a Strombecker set that I got one year for Christmas. Been running and building them ever sents. At the present I have about 200+ cars,still building. This is the GREATEST Hobby in the WORLD (BAR NONE). Slot cars were big during my youth and I enjoyed alot of race time at the Playland Modelcar Raceway located at Ocean Beach in San Francisco, once the largest slot car facility in the United States. Now it seems there is still an active community of slot car enthusiasts who post on facebook in various slot car groups everyday. Is slot car racing enjoying a resurgence? It seems there is quite an active community still enjoying this hobby. The only problem is that commercial slot car tracks are few and far between and home built tracks seem to be the new wave of slot car hobbyists. I know it will never enjoy the glory days of the 1960’s but are slot cars back again? “ ” Suddenly, men were presented for sale as women had been.